I love The Cease for being from the Midwest. I love his penchant for hard to injure quarterbacks and the irony of his lactardedness as a Wisconsinite. But his most redeeming quality has to be his ability to find an obscure foodstuff in an all too common location. The foodstuff of note this time around being the buzz meat La Quercia, a domestic porker available to purveyors only as a whole hog. Making local prosciutto has to significantly reduce the cured meat's carbon footprint, which is a grand thing for mother earth, but I was upset to see such a huge markup in Manhattan, where the premium (at Otto, natch) was double what I paid at The Jake Walk in Carroll Gardens ($5 for a single there as opposed to $10 in the big city). Granted, the fuel consumed by a refrigerated meat truck idling on 8th Street and 5th Avenue at 5am on a Tuesday might beg the premium, but I would rather Mr. Batali work it into the price of his myriad Italian wines, or any other combination of his non-local ingredients kicked out of the earthy boot that is his Disneyworld. 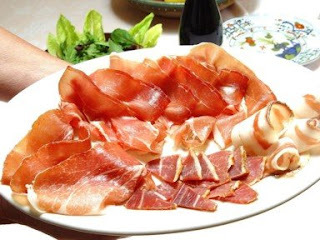 I'm all for paying the premium associated with consuming local foods, but if your entire menu is FOB Italian, you should probably forgo the opportunity to serve domestic prosciutto, especially if you're going to charge and arm and leg (and a shank) for it. Let somebody else benefit from that gimmick. Buen provecho.